The daughter of Rudy and Felicita Jojola, Stella Teller was born at Isleta Pueblo in 1929. 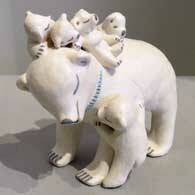 It wasn't until about 1962 that she first appeared in the marketplace with her earliest pieces. 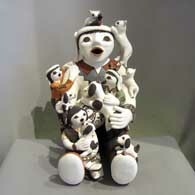 Since then she has earned numerous awards at the SWAIA Santa Fe Indian Market, the Eight Northern Pueblos Arts and Crafts Show and the New Mexico State Fair for her distinctive storytellers, nativities and non-traditional jars (canteens in particular). 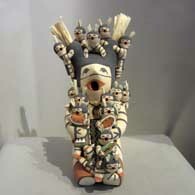 Stella's pieces are notable for their "sleeping eyes," overall light-blue to white coloring and often have strings of heishi beads either inlaid or painted on. Some of her pieces have found their way into the collections of the Peabody Museum at Harvard College in Boston, the Folk Museum in Berlin, Germany, and into the Wright Collection, Walton-Anderson Collection and the personal collections of Frank Kinsel and Peter B. Carl. Her favorite designs include clouds, rain, turtles, Pueblo dancers and kiva steps. 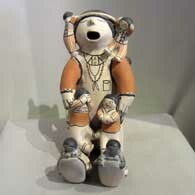 Her favorite styles include storytellers, Nativities, jars, bowls, wedding vases, canteens and effigies. Stella has passed her knowledge on to her daughters: Chris, Mona, Robin and Lynette, each of whom has gone on to become award-winning potters in their own right.